This week’s episode of Manhattan is all about controlling the wild card that is rogue physicist Frank Winter. Colonel Darrow tightens the screws, to reveal just how ruthless he’s prepared to be when it comes to maintaining discipline in his camp. We last saw Frank when he showed up on Charlie Isaacs’ doorstep, after his release from that Texas prison. He naively thinks all he has to do is spread the word of the Army’s lies—“There is no Nazi bomb!”—and Charlie will join him in a revolution to stop the building of the bomb. (The Germans most certainly were working on their own bomb, but there was little known about their progress at the time.) But in the interim, Charlie has become “pot committed,” as General Darrow puts it; he has set his own ethical qualms aside, at least for now. “There is a war on three continents and a madman rounding up Jews,” he tells Frank. That bomb is going to be built. 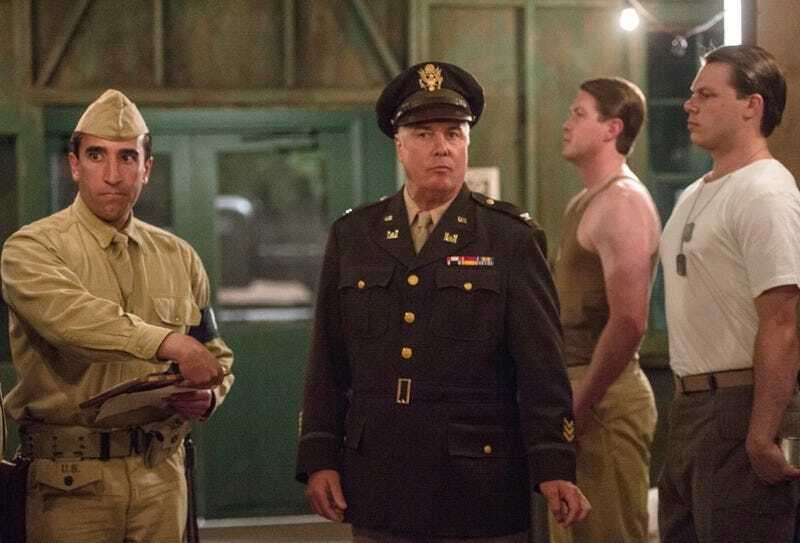 Frank is promptly re-arrested, and brought before Darrow, who offers him a choice: go back to his Texas prison, or play along with Darrow’s official story as an enlisted private in the U.S. Army, under the colonel’s direct command. And just like that, Frank becomes “the best educated grunt in the US military.” Poor Liza is trapped on the Hill, too. And Darrow separates them: Frank must live in the barracks, like a good soldier, and is forbidden to communicate with her. There is one bright spot to digging trenches: Frank is in the same barracks as Private First Class Dunlavy, his daughter Callie’s sweetheart. (At least Callie is safely out of the country in Montreal.) They start to bond. And that makes Frank vulnerable yet again. Darrow makes an unscheduled visit to the barracks one day with orders sending Dunlavy to the front lines in Saipan — what Frank calls “the bloodiest theater in the goddamn war.” Darrow does it solely to punish Frank for one late-night visit, to talk to Liza in the medical clinic. And of course, the inevitable happens six months later. As the denizens of the Hill are counting down to the new year and celebrating the dawn of 1945, Frank is working alone when he receives a package from Dunlavy. Except it’s from one of Dunlavy’s compatriots, letting Frank know that the private was killed in an accident on a transport the month before. Add one more death to the growing body count on Frank’s conscience. Abby has miscarried and she wants there to be a reason. She shows up at Liza’s workshop teaching young mothers about proper infant care, because she knows Liza is worried about possible radiation having adverse affects on health (especially on pregnant women). But Liza is first and foremost a scientist: she has her suspicions, but not evidence. Out of 127 pregnancies on the Hill over the past year, there has only been one late-term miscarriage. “There’s not always a medical explanation in these cases,” she gently explains. Incidentally, Crosley is cagey when Lorentzen asks him why the new gun model design is code-named “Little Boy.” But the source is well documented. Oppie’s former student, Robert Serber, was tasked with all the code names. He always said he chose them based on their design shapes, drawing on his love of Dashiell Hammett’s characters: The Thin Man (for “Thin Man,” duh) and The Maltese Falcon (“Fat Man” and “Little Boy”). Image of William L. Laurence courtesy Los Alamos National Laboratory.